Technology and research in the field of tissue engineering has drastically increased within the last few years to the extent that almost every tissue and organ of the human body could potentially be regenerated. With its distinguished editors and international team of contributors, Tissue Engineering using Ceramics and Polymers reviews the latest research and advances in this thriving area and how they can be used to develop treatments for disease states. Part one discusses general issues such as ceramic and polymeric biomaterials, scaffolds, transplantation of engineered cells, surface modification and drug delivery. Later chapters review characterisation using x-ray photoelectron spectroscopy and secondary ion mass spectrometry as well as environmental scanning electron microscopy and Raman micro-spectroscopy. Chapters in part two analyse bone regeneration and specific types of tissue engineering and repair such as cardiac, intervertebral disc, skin, kidney and bladder tissue. The book concludes with the coverage of themes such as nerve bioengineering and the micromechanics of hydroxyapatite-based biomaterials and tissue scaffolds. 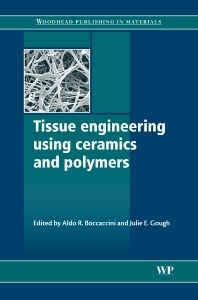 Tissue Engineering using Ceramics and Polymers is an innovative reference for professionals and academics involved in the field of tissue engineering. Professor Aldo R. Boccaccini is Professor of Biomaterials and Head of the Institute of Biomaterials at the University of Erlangen-Nuremberg, Germany. Dr Julie E. Gough is a Senior Lecturer in Biomedical Materials at the University of Manchester, UK. Dr Gough is widely respected for her research and activities in the field of biomaterials and tissue engineering.